Twelve Trees Self Storage is a modern quality facility, located in the Twelve Trees Business Park 3 Miles North of Poulsbo, Washington. All of our unit's are heated and are protected by a fire suppression system and alarm monitoring system. 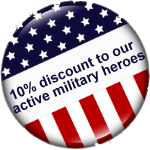 We offer a discount for our military customers. We accept Visa, Master Card, American Express & Discover. Free lock with every unit. 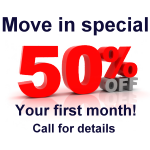 No advance fees or charges to rent a unit.